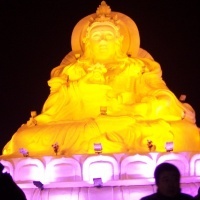 Harbin Ice and Snow World is annually hosted by Harnin Modern Group (aka Harbin Ma Die Er Group). It is probably the hottest winter vacation destination in the world. 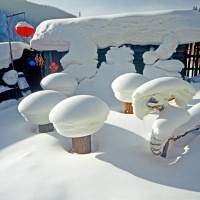 Here not only can you enjoy the world-class snow arts and beautiful ice sculptures but also relax yourself by taking part in various interesting ice and snow activities. It consists of three areas, namely East Scenic Area, Central Scenic Area and West Scenic Area. East Scenic Area: This area is the paradise of children. It provides many facilities and places for children to enjoy ice and snow activities. There are skifields, slides, children's playground, Christmas square, labyrinth and the big inflatable buildings. In addition, here you can do some shopping, enjoy the local yummy food at the restaurants, or rent ski items. Central Scenic Area: The main area of the Ice and Snow World. It is made up of some ice mountains, Time Square, Century Clock, giant ice colonnades, ice fountains, multi-colored ice screens and so on. This area is also the designated venue for the opening of annually Ice and Snow World. 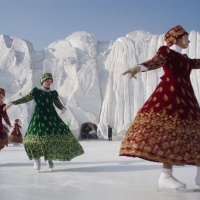 On the duration, you can enjoy various wonderful shows, sleigh rides, skating, ice disco, or participate in night masquerade. West Scenic Area: This area is comprehensive. It consists of some attractions including the Future World, High Antiquity, Northeast China Folk-Custom Garden, Oroqen Folk-Custom Garden, Continental Europe Garden, Adventure Paradise and etc.. 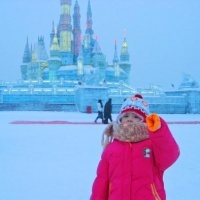 In this area, you can see many big fantastic ice duplicates of Chinese and foreign buildings, climb ice hills, drive ice karts and snowmobiles, taste delicious Chinese ethnic cuisines and authentic Russian food etc..
Harbin Ice and Snow World has been annually held in the west part of the Sun Island since 1999. It usually lasts from December 25 to the next late January. And the below classical Harbin Winter Tour Packages are designed to satisfy your desire to experience the fantastic Ice And Snow World!